To understand the visual impact of the Kennedys—and, yes, their impact was more visual than anything else—you have to appreciate the aesthetic dullness of the political landscape into which they burst. 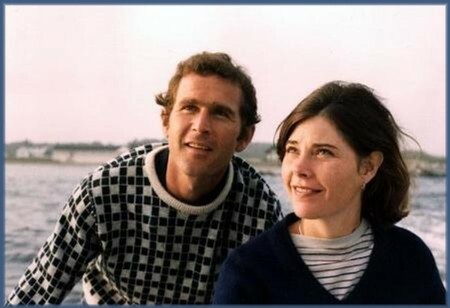 In brilliant contrast to the contemporary politicos, with their grizzled visages and frumpy, mink-swathed wives, the Kennedys were unlike any political couple Americans had ever seen. 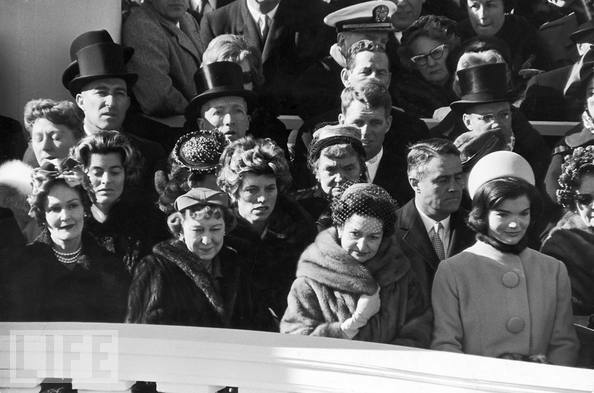 Just look at Jackie in the audience at the Inauguration. Situated in its historical context, her cream colored suit appears clean, crisp and vaguely futuristic. It shines like a hopeful beacon amid the sea of animal pelts. Historian Gary Willis characterized theirs as a “rule by dazzlement,” a phrase that goes a long way in capturing the First Family’s stunning visual impact. With the advent of television and the resulting drop in movie attendance, the fan magazines reached a crossroads. To remain relevant, they had to expand their gaze beyond the Hollywood hills. It was an admirable pursuit and herein lay the distinction between the fan magazines and the mainstream press. Though their coverage was similarly characterized by provocative images and personality-based narratives, their approach was markedly different. The “serious” publications covered the Kennedys as political personalities, while the movie magazines approached them as show business stars- which they were. In “Jackie”: The Exploitation of a First Lady, Irving Shulman—sociologist/misogynist— suggested that the movie magazines offered “uterine tidbits” and “a clitoral interpretation of life” to their largely female audience, a dastardly editorial policy that, in turn, infected the entirety of the mainstream media. Shulman uses the tabloids’ Jackie Kennedy coverage to illustrate this insidious trickle-down effect. This is interesting, yes, but it is also wrong. The mainstream press latched onto the Kennedys’ spectacular appeal early. The family had received regular press coverage since Joe Kennedy’s days in Hollywoodand his subsequent ambassadorship in the Court of St. James. They were no strangers to publicity and, in July 1953, before she was even married, Life ran a four-page spread on Senator Kennedy’s fiancé. A similar cover feature appeared in 1958 and, a year later, the FRONTRUNNER’S APPEALING WIFE was front-and-center in a cover photograph, with JFK hovering in the background, curiously out of focus. In the fall of 1960, Look followed suit with an article on all the Kennedy women and a cover of the Senator’s 29 year old wife in a strapless dress with a hint of cleavage. At the time of the Inauguration, Ladies Home Journal was running serialized excerpts from Mary Van Rensselaer Thayer’s authorized biography, giving readers an intimate peek into the new First Lady’s life via singularly florid prose. By the time the movie magazines began hesitantly running her on their covers in the winter of 1961, Jackie had been making regular appearances in Life and Look for nearly a decade. Such reports were stylish, authorized and, often, in full-color, but they were also— at their core— fueled by provocative images and personality-based narratives. By 1961, the mainstream magazines were already strolling down the path upon which the tabloids were about to stumble. Fan magazines [are] considerably more than a trifling symptom of American malaise, and this symptom, could explain the American public’s conditioned acceptance of such obscenities as genocide, favorable kill ratio, nuclear fallout, murder, a geometric increase of violent felonies, starvation, slums, denigration of the human condition, fine print in consumer contracts, demagoguery, venality and stupidity in public office, and a spate of social violences which imprison juveniles in a delinquent society of adults. Um… yeah. Any way we look at it that is an amazing assessment, never mind the way that Shulman goes about proving it. “Jackie” is interesting because it offers a framework for analyzing the social impact of the movie magazines of yore that’s equally applicable to the celebrity magazines of today, and also because it is fantastically misogynistic. Shulman’s argument is predicated on the notion that the movie magazines catered to their primarily female audience by offering “uterine tidbits” and a “clitoral interpretation of life,” an interpretation that, in turn, infected the entirety of the mainstream media. So, what he’s saying is that the movie magazines (ie. “women’s magazines”) single-handedly lured the mainstream press (ie. “men’s magazines”) to drink from the tabloid trough. He then uses the tabloids’ Jackie Kennedy coverage to illustrate the trickle-down effect. the podcast can be accessed HERE on the New Books Network or on iTunes. so you don’t want to read a novel that’s a fictional account of the life of laura bush? HERE‘s my (convincing?) argument for why you should. the naked lady bar writing group’s sensei austin h. gilkeson has written a wonderful, amazing, incredible, tremendously brilliant story for which there are not enough glittering superlatives in all the world.